David Belle is the founder of parkour and is the most famous traceur. He has been in various movies, films and documentaries like Banlieue 13 (2004) the most famous Freerunning movie. Since a young kid he was always jumping around wishing he could be like Spiderman and other super heores.Him and his brother Cole didn't want to be typical boys.They begn doin parkour at 14 and have continued ever since. Chase thought that parkour on its own did not chalenge him enough so he began doin street stunts imitating what he say in action films like the matrix and jackie chan films. When he was 17 he started Wushu he now represents the country. Sébastien Foucan is the father of Freerunning. He created it with the help of David belle and various other traceurs. 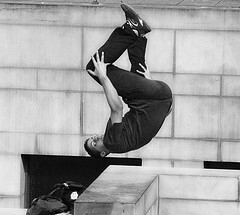 Free running was greatly influenced by parkour; he is considered to be a "second generation" founder of parkour. He is well known as a traceur and is considered an icon in many countries. He is also well known for is view of the philosophy of parkour. He thinks it is important to do the right training for parkour not only for safety but to keep the publics view of parkour positive. Yamakasi are a French group of Traceurs, formed in 1997 by David Belle, Sébastien Foucan, Yann Hnautra, Charles Perrière, Malik. They were the first group to ever form and practise Parkour. All of the members were inspired by previous works by Georges Herbets and the obstacle course training they had received in the national service. The Yamasaki formed after they left the national service. This is where they had all met and discovered their physical passion.